Journalist Omar El Akkad has reported on protests ranging from the Arab Spring to the Black Lives Matter. The Egyptian-born, Canadian writer launched his debut novel American War about a not so distant future where a second American civil war breaks out. 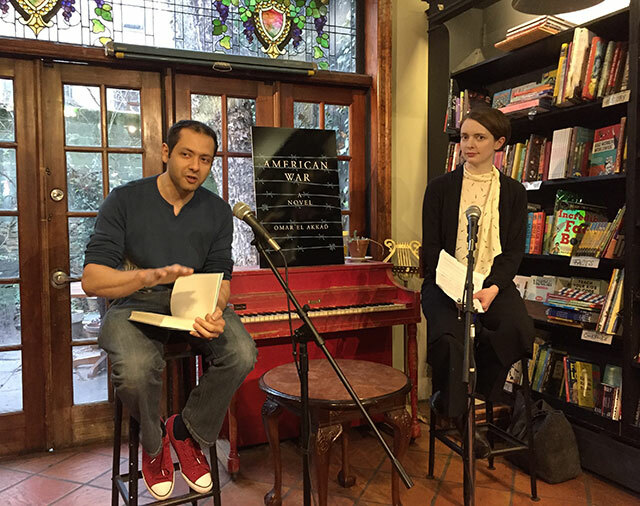 He was at Community Bookstore in Park Slope to discuss the novel with Emily St. John Mandel author of Station Eleven. American War began with with El Akkad watching talking heads discussing soldiers conducting raids in Afghanistan. Soldiers would ransack houses while the families watched. He wanted to recast those elements in a framework that was closer to home. El Akkad has been tear gassed while on assignment–once abroad and once in Ferguson, Missouri, during the Black Lives Matter protests. Foreign suffering is an idea that militarized police disrupt. There is privilege living in a place that is not regularly bombed, he explains. St. John Mandel draws a comparison between El Akkad and Margaret Atwood, both being Canadian authors having written dystopian novels set in America, and she points out that Atwood’s A Handmaid’s Tale is often taught in American literature courses. El Akkad says he doesn’t have any sense of roots to a particular geography. He grew up in the middle east, a region where citizenship is impossible except to have been born into it. Eventually he emigrated moving to Canada and now lives in the United States. Perhaps then, unsurprisingly, he says European audiences have not seen the novel as an American story but instead look at it as a story about revenge. “I can’t wait to see the Arab countries react to this book,” he says, explaining publishing rights have recently been sold for the region. The novel is set in the future and as a result much of the United States that exists today no longer does in the novel. Much of where the population today lives has been disrupted by climate changes. El Akkad says he sees the The miracle of the United States as that it sticks together despite the many challenges trying to rip it apart. Writers must look beyond their own experience. For El Akkad, he has only the experience of a single thirty-five-year-old man. The challenge for a novel is crafting characters outside of that experience. His protagonist, a young woman, is very trusting. She is curious. Eventually both these traits are used against her. There are moments in the novel that El Akkad believes he might have failed. Fossil fuels in the novel cause the start of a new civil war and the analogy he wanted to draw was to the first Civil War. His intent is not to suggest that slavery and burning fossil fuels are on par with each other, but in the sense that bother policies that benefited some people and that others are complicit in, and that would ultimately cause a rift in America. The first draft of the novel was written in 2014, long before Trump’s rise and the start of the American crisis. Then Trump announced his candidacy and suddenly the alternative, frightening future El Akkad had created seemed much less impossible. Today, he wakes up and the news is so absurd and far fetched that it wouldn’t be taken seriously if it had been pitched as a novel. America has enjoyed for a time the freedom from consequence that comes with being a dominant empire, though that could change. “I’m not sure of anything,” he says.